Anne McGoldrick, right, prepares meals to be dropped off to shut-ins at her home kitchen, along with daughter Mary Kate. Philadelphia-based Aid For Friends is like a three-legged stool. You have roughly 2,000 shut-ins, an army of volunteer cooks who prepare and freeze dinners for them, and the connecting link — the more than 1,000 volunteer visitors who deliver the meals. Anne McGoldrick, 45 and a member of Immaculate Conception Parish in Jenkintown, is one of the visitors who not only deliver food but provide a social link for people who generally do not have many visitors. Anne, who along with her husband Gerry has two teen daughters Julianne and Mary Kate, is originally from St. Charles Borromeo Parish in Drexel Hill. She is a graduate of Archbishop Prendergast High School and Boston College, and an accountant by profession. Aid For Friends was begun 41 years ago by Rita Ungaro-Schiavone specifically to serve those who are homebound, mostly elderly, but others with disabilities who might find it difficult to prepare meals. It operates mostly through a network of churches and synagogues whose members cook and freeze meals, which are then gathered by the visitors and delivered usually once weekly. It’s not just a matter of dropping off at the door a meal that can be reheated. The visitors usually spend at least an hour socializing with the person that is visited. There is no charge for the meals, which means those visited, who are often on a limited budget, can use their funds for other needs. Anne was introduced to Aid For Friends six years ago through a presentation at her parish. She’s been visiting Mary Brownell ever since. Mary is a widow, and has been a resident of Holy Redeemer Village, an independent living facility for the elderly in Huntingdon Valley, for 26 years. Anne McGoldrick is a volunteer with Aid For Friends and along with her family, a member of Immaculate Conception Parish, Jenkintown. In addition to visiting Mary, she sometimes fills in visiting other shut-ins when needed. Most recently that includes people temporarily relocated because of Hurricane Sandy. 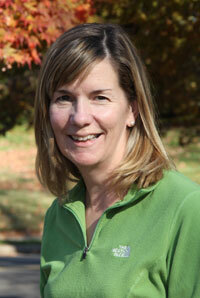 For the past six months Anne has also been Aid For Friends’ intake coordinator for Delaware County. In this capacity she visits people who have been suggested for the services of Aid For Friends, determines their eligibility and whatever other needs they might have. She works with Eileen Brophy, another volunteer who coordinates visitors and between them they see to it that basically everyone who needs Aid For Friends is enrolled in the program and served. As a matter of fact, Mary’s son Charlie does other shopping for her and she also has a niece who helps her, but there is no one to prepare meals on a daily basis. Anne’s relationship with Mary has gone far beyond visitation. “Generally speaking, when you are a visitor you just pick up meals made by somebody else and you deliver them,” Anne said. “In a practical sense — and I know it happens with other people too – I tend to make most of her meals myself. Anne brings food to intake clients Ann LaRovere (and her husband George) who are displaced to Collingdale due to Superstorm Sandy. They’re from St. Thomas Parish in Brigantine, N.J., originally from Our Lady of Loreto Parish in Philadelphia. The couple is staying in a duplex above her sister until they can return home. For her part Mary considers Anne her best friend. The Mass is really for herself, but visitation with Aid For Friends is especially satisfying.